BOOK- This weeks book was one I decided to read because it was set on Martha's Vineyard. The author basically packed up and left Michigan to live on Martha's Vineyard for 3.5 months. 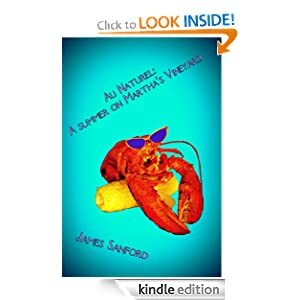 This book, roughly 100 pages, documents his time on the Vineyard-from lobster rolls to his beach adventures to working for free and everything in between. He paints a picture of what Vineyard life is like, which will make you either want to go back (if you've been in the past) or visit for the first time. In reading this book, I could picture myself on the Vineyard taking part of the 'action' in this book. A quick, easy, heartfelt and entertaining read. Perfect for anyone that has a fondness for Martha's Vineyard or enjoys reading memoirs and learning about a person's experience. SONG- Canada Day was on Sunday...so, in honour of Canada's 145th birthday, three songs this week! This is not a family friendly song, but this version was performed at the Junos (Canadian Grammys) so words were bleeped out. This one of my favourite songs of 2012! What would a Canada Day 'playlist' be without a Hip song?!?!? BODY- I spent the weekend at my parents house, which means I got to spend time in the pool! My parents have a salt water pool. If you have the chance to swim in a salt water pool, I HIGHLY recommend it. We all know that swimming is a great form of exercise and a way to stay cool in the summer. Unlike chlorine, the slat water is easier on your hair and doesn't smell/sting your eyes/etc. What I really love about swimming in the salt water pool is what it does to my skin! My skin is softer, smoother, clearer and cleaner- it just feels and looks so much healthier! I'm not sure if this salt water skin secret applies to just me or everyone- which I hope it does!